A Bird Hunter's Thoughts: Re-Post Review of GO CLAWS Mud, Snow, Sand traction devices! Re-Post Review of GO CLAWS Mud, Snow, Sand traction devices! They are a special type of polymer. Tough as nails and legal everywhere. That's a bunch of gripping action! It's a common problem when hunting out west, or even here in GA on the red clay back roads we have. Out west, many times, the roads will be frozen heading in to the back country, and will thaw during the day, making getting out somewhat problematic. In the south, even a slight rain turns the red clay roads into a form of slick snot. I don't care how many wheel drive you have, you ain't going anywhere. Tires are a factor, but I like to have some form of chain to put on my wheels, in the event I need to get somewhere, like bed and a hot meal. 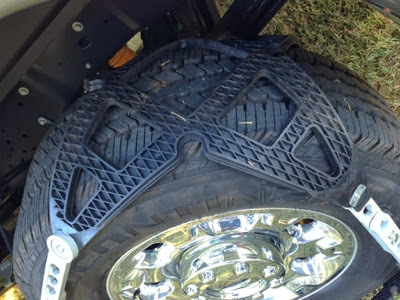 I've used actual chains when getting stuck on some North Dakota roads, and it was a pain, and muddy. But, eventually, they worked and I got myself unstuck and on the way. Twice in my hunting career, I've relied on the largess of a local farmer to pull me out with a tractor. (Both times those tractors were so big, they could have pulled the dark out of the night, I think.). I knew there had to be a better way. Go Claws. (http://www.flextrax.com/). Google searching produced this interesting little article. I followed up with a call to the company and the owner, designer picked up. Nice guy! I ordered a set, then another set. I figure, if I put one of these on each wheel, I'll be able to go anywhere, anytime. They are incredibly easy to put on. Literally, after you do it once, it will take less than 5 minutes per tire, more like a minute. 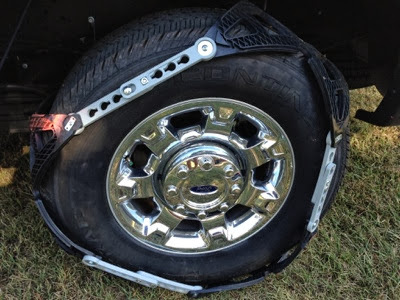 You can drive with them on bare road for many miles and not damage the tires or the road. And they grip like a tick on your best bird dog! Recommendation: go to the website and watch the videos. My recommendation is a buy. I have a set for each tire and it gives me great piece of mind while on a trip and seeing storm roll up the valley. "Bring it!" I think. "At least I'll make it back to the motel."